Have you ever had a dream that you awakened from and you found your heart rate raised, brow a bit sweaty, and it all felt so real? Was the dream so good that you wished you could fall back to sleep and finish it. Or maybe you wanted to live that dream out in your reality. This message isn’t for the dreams that have nothing to do with your hearts desires. This is for the dream or dreams that you’ve wanted to live out all your life; in the last few years; in the last six months. 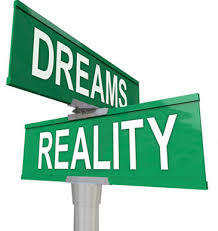 Let your dreams be your reality! Every day you wake up have a heart rate enthused and set on ready to take on your dreams; your realized happiness in life. Let your reality be the middle point between your sleep; your dreaming. Heck day-dream! 😉 Start or continue today with the plans that will make your dreams come true. Be passionate about those plans. Be intentional, intuitive, and inspired to want to hold on to your happiness. Don’t believe that when you’re sleep that’s the only time you’ll have the opportunity to be the person you’ve always wanted to be. Some say dreams have meanings. And while I may not know all the details of what each dream may mean, I do believe you should try to find the truth in the ones that have you wishing you could make them apart of your daily life. Be prepared to live life actively following them in between your dreams. Don’t sleep on your dreams. Don’t let them exist only with your eyes closed and conscious unknown. I believe that you can and will live life passionately, find your happiness, and live in the middle of your dream! Until the next post, live out loud passionistas! I am always inspired because you are! Thanks for sharing sweetmarie9619.